Vegetables Billing Software is ready-to-use POS software for fruits and vegetable stores to manage billing, customers, inventory and accounting with ease. Vegetables are perishable goods. So, items have to be sold in just a couple of days maximum or else owner can incur losses. As inventory buying is a daily process, the owner has to work in a smart way to reduce the losses and wastage by following techniques like first in first out selling method. This is one of the features every vegetable business owner need. Usually, products supplies happen on daily basis. It’s better to keep a track of suppliers which makes purchase order work so easily. You don’t need to keep any efforts, Just billing vegetables billing software can operate by anyone with ease. Just select the products you want to bill, choose the payment mode and then generate an invoice. As most of the items are perishable in nature. You always need to plan inventory according to demand of the products to reduce the wastage. Getting a few damaged items are common. Just billing allows you to note down damaged goods separately in inventory. In this busy life cycle, providing home delivery option is really an add on advantage to the business. In just billing, you can map order to the delivery agent to deliver to the customers. Even you can allow customers to pay cash on delivery or different payment methods. No worries about the internet connection. Just billing works offline smoothly without any trouble. All your data gets back up once the vegetables POS software connects to the internet. So you can use the point of sale software anywhere you want. Just Billing billing vegetables billing software for a single store/device is absolutely free. When you want pos software in more devices or for the multi-store purpose, the prices will be charged accordingly. The pricing of our pos software is the most affordable and best in the market. There are few expenses like transport, labor cost and many more are needed to keep a track of it. Just billing keeps the record of all your business expenditures, which also helps in accounting process to categorize expenses easily. Vegetable business owners may not have any knowledge about the accounting process. All they want is to know how much profit they are earning. Just billing does all the accounting process automatically. It also gives the daily sales report, so that people can know how much money they made at the end of the day. 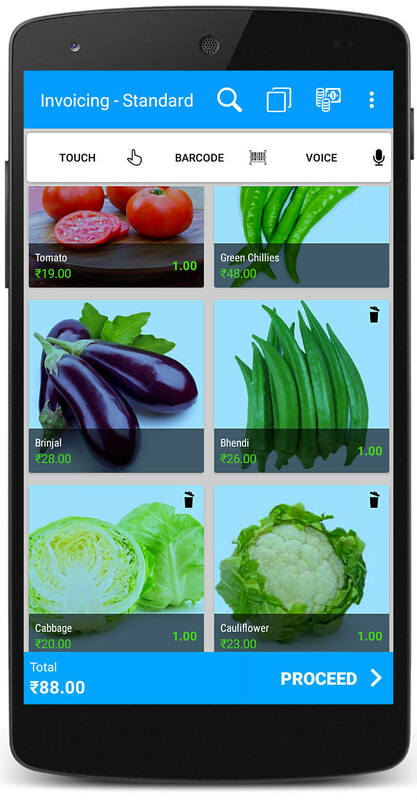 Download and follow simple steps to setup Just Billing Vegetables Billing Software.